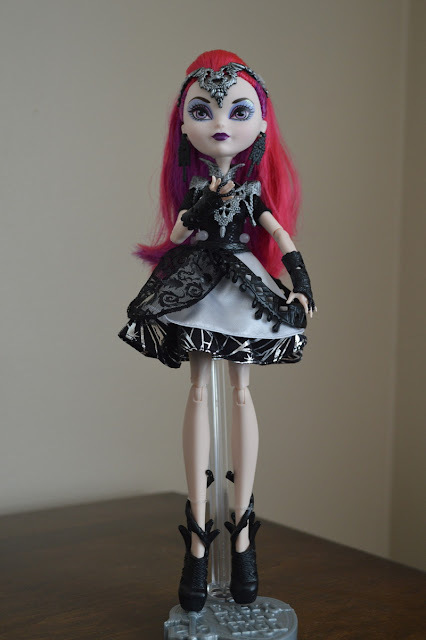 I've been doll buying crazy lately! I have again another newcomer. Yay! I was shopping at Toys R Us.com for a tub spout protector for Jacob. I looked in the doll section and saw a deal I just couldn't pass up. 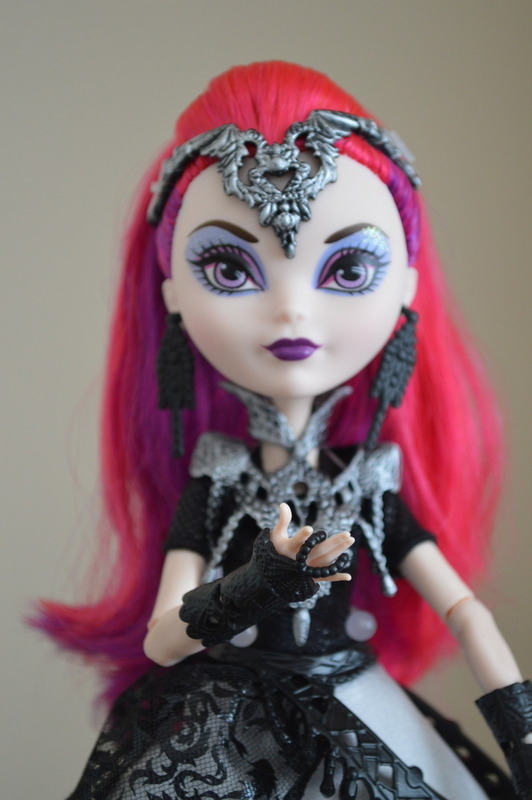 Introducing The Teenage Evil Queen! She was a whole $12 and if I spent $15 I got free shipping. Combine that with the tub spout protector and I had a great deal! So just how does Raven's mom escape the mirror and disguise herself as a teenager at Ever After High? There are spoilers below so scroll past if you don't want to read or haven't watched the "Dragon Games" film yet. Mira stays true to her webisode form and I just LOVE her outfit. She has fiery red hair mixed with purple and a beautiful headdress which is held on by hangtags. Her hair is in a long ponytail. It's beautiful and soft but did need a good brush coming out of the box. 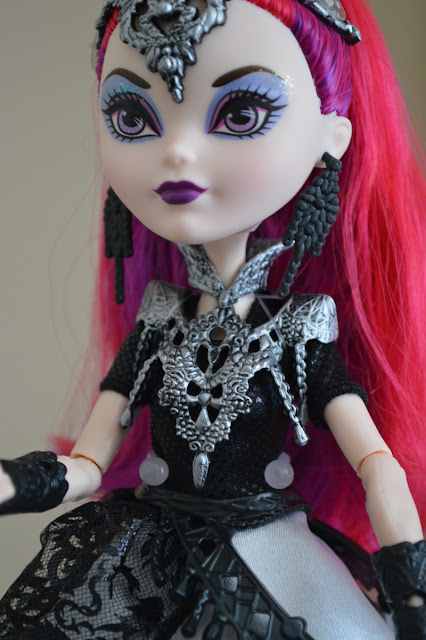 She has a chestplate with a small collar and black chandelier earrings. 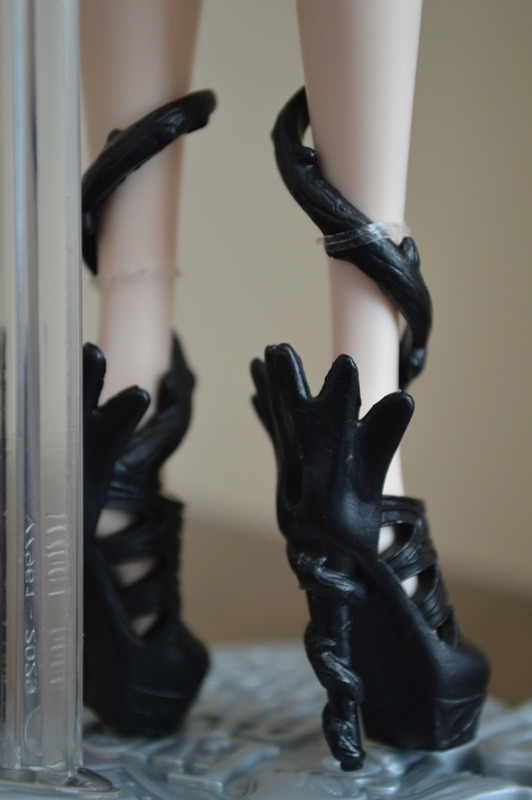 Her skirt is beautiful with a lace design on her right side and part of her belt on the left. The "drips" coming off the belt gives it a wonderfully evil vibe! 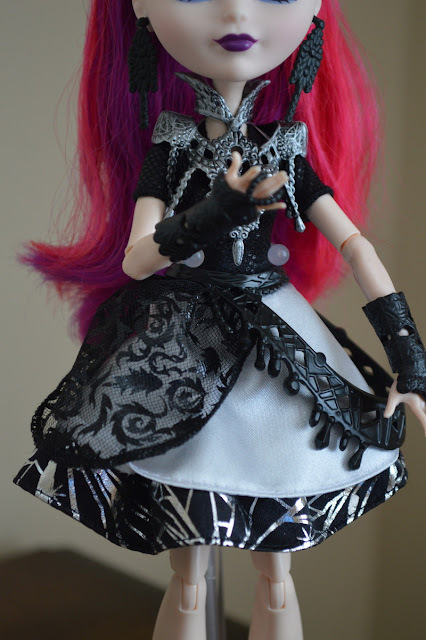 She has a petticoat to make the skirt flare and her trim is black with silver to resemble a shattered mirror. These are great shoes. 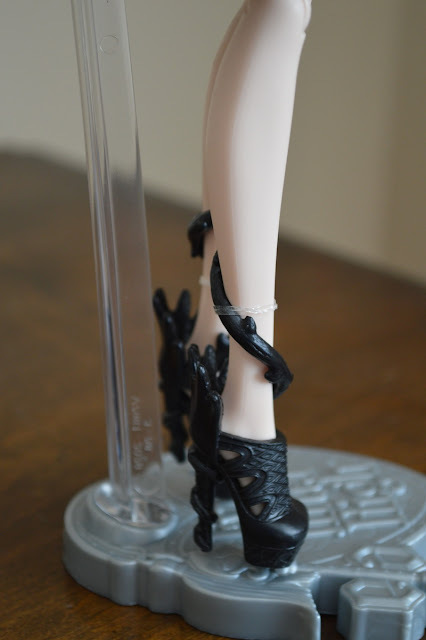 Kind of take on Ashlynn's shoes in that they have a vine spiraling up the ankle. The vine spiral down the heel and the backs are made to look like the collar both Raven and her mom have. I was curious how alike Raven and her mom in Teenage form looked. I can see a resemblance! The dolls are actually the same height but the way they are positioned on the stand makes Mira look taller. So, let's have a look at the entire shelf! I am going to be sad to see this nice display case go. This is the perfect way to display my EAH collection. I'll have to make a new shelf for them at the new house. Mira is down on the end table with the lamp. My Way Too Wonderland Lizzie is there too. As you can see, it's getting quite crowded up there! 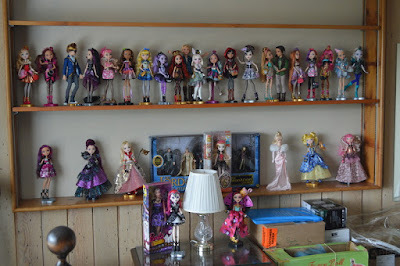 The top shelf is not tall enough for a doll to stand up. 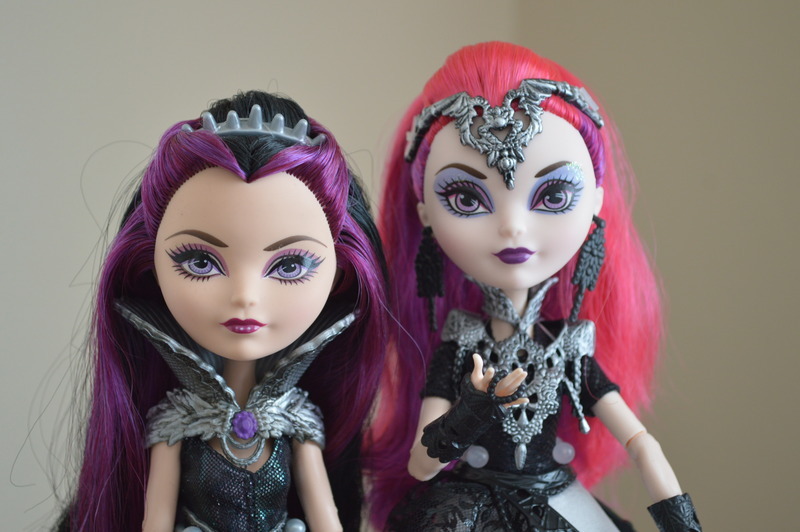 Well, what do you think of Mira Shards, the teenage evil queen? Will she be joining your collection? Let me know in the comments! I'm going to start a new mini-series featuring some throwback dolls from my personal collection. It will be fun to take a trip down memory lane and feature some dolls that may be new to all of you! I can't wait to get started on it. She is definitely on my my list, Teresa. I love dolls with unusual hair colors and she is adorable. She is great! 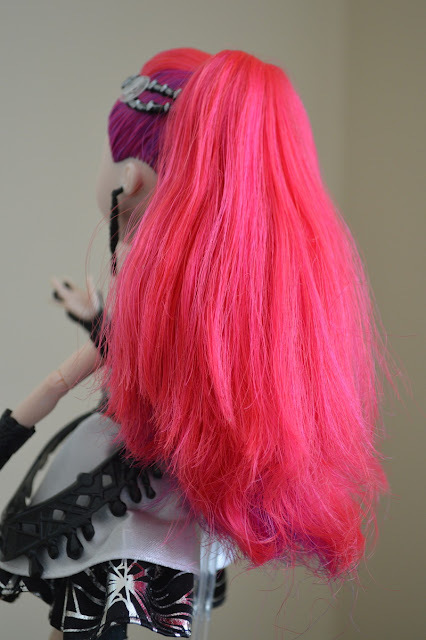 I love how they chose those colors for her hair. Just love everything about her!